Welcome to 749 Queensway in award winning Maple Leaf Golf & Country Club. 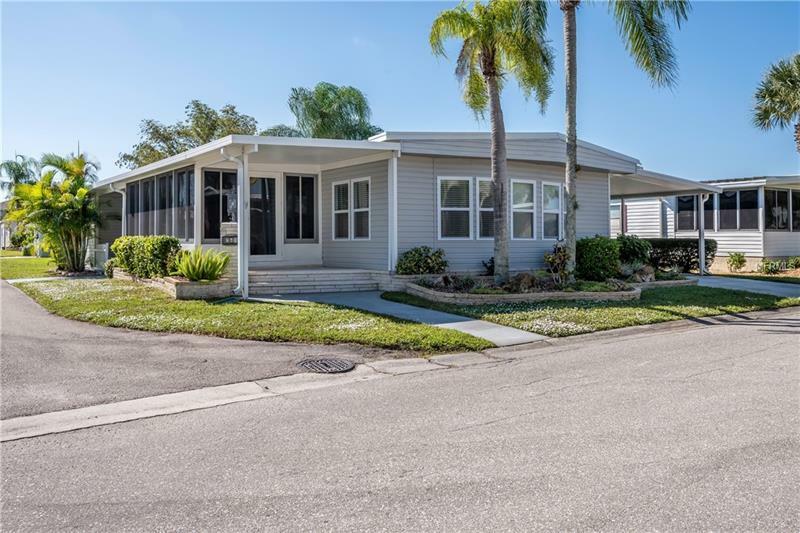 Open and spacious 24'x54' 1980 Jacobsen built double-wide manufactured home with 1296 sq feet of living space attached carport 2 sheds patio or golf cart parking. Situated on over-sized 4984 sq ft premium interior corner lot. This super clean and maintained home is sure to appeal to you whether you're year round or seasonal. Large bonus room at the front of home is an added bonus if you love to entertain PLUS there's a large lanai as well on the side of the home which opens to the patio (or golf cart parking) and one of the TWO SHEDS with this one having double doors where you can park your golf cart. Master bedroom with en-suite bath features walk-in shower and a walk in closet. Guest bathroom has tub/shower combination. The second shed contains the washer/dryer. Located in a resident owned 55+ gated golf course community with an active resort lifestyle. Features 75+ clubs/activities including a Par 62 golf course 5 tennis courts bocce ball lawn bowling 2 shuffleboard courts 4 heated swimming pools 2 hot tubs fitness facility woodworking facility 2 pickleball courts restaurant with full service bar and much more. Home prices INCLUDE $40000 membership certificate/share. Monthly HOA fee of $256. No dog allowed at this lot location indoor cat only. Sold furnished as equipped and shown. Sold "as-is" with right to inspect. Pet Restrictions: NO DOG. One indoor cat only.